At Rue Meurt, we are great fans of musical discovery, lulled by this urban culture where new talents abound. In this article, we are going to present you a piece of the Belgian Underground world by presenting you a very promising young artist composer of the psytrance scene. The psychedelic Trance, also called psytrance is a form of electronic music appeared in the early 90 ‘in Goa in India, hence the name “Goa” or “Trance Goa”. This music is characterized by a fast pace, in the ranges of 125 to 160 beats per minute (BPM) unlike other forms of slower electronic music such as minimal, house or Techno. The bass is strong, twirling, without interruption, often entangled by other rhythms. In a global way, the goa turns to surprising, unexpected and sometimes unreal, immaterial sounds. DJs use different musical sources that they rework to include in their compositions in the form of “Kick” (beats rhythmic). The Goa will thus not value the melody, but the synthetic rhythm pushed to the paroxysm of the systemic repetition. Adepts will often tell you that they can dance for hours to sharpen sometimes even without advocating drug abuse, this music takes you to the guts, leaving you no other alternative than a letting go of the most enjoyable. I advise each of our readers to go at least once in their lives to a Goa party, because we feel like we are traveling beyond time in a world of multiple colors, which takes us away from our graying and depressing urban setting. If you are a big fan of Funeral Folk Band, you should follow this link. Now let’s get to the heart of the matter ..
Asmik is a 22-year-old Dj born in Moscow in a Russia plagued by the big problems of economic restructuring caused by the fall of the wall as well as the more dubious politics of Boris Yeltsin . During the 1990s Russia wavers between corruption, inflation, wars. At the age of 3, his family immigrated to Belgium thanks to his grandfather, who obtained a position as a journalist, which enabled them to escape this complex social situation. After a detour through Paris, Asmik completed his secondary studies in Brussels, he is now a student in Sound Engineering at SAE. From an early age this autodidact, allergic to strict dogmas of solfège, was attracted by the electric guitar, “I always found this fascinating instrument.” It is with passion that he embarks on this apprenticeship towards his 14 years. It was at that time that he had an attraction for rock metal, a period during which he was quite closed to other styles of music, such as rap that repugnant him, because contrary to his ideology of the time . Around the age of 15, friends introduced him to the world of techno, hard tekno and Free Party. As a result of these new musical discoveries, he is interested in composition, he began to experiment with software such as “Fruty Loops” and “Reason”, which gives him a rather broad vision of electronic music as well as his creation. In 2009, he will acquire his first electribe, which allowed him to improve a lot. 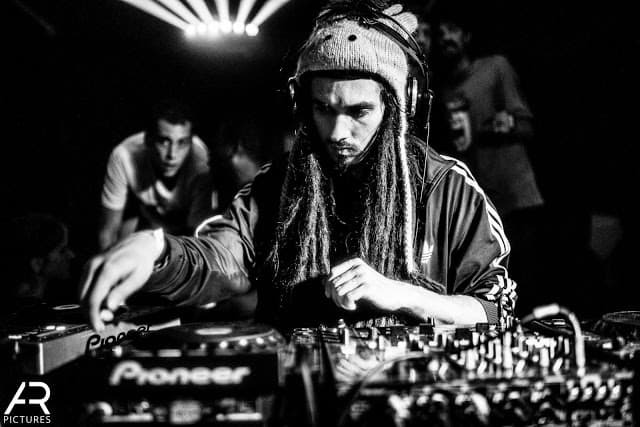 A year later, he began his first live with the BASS label, including club, Kultuurkaffee, this experience launched at the front of the underground scene in Brussels. Shortly after, he gets noticed by another Phonyrik Records label. His artistic consecration gained momentum in 2012 when he was invited to play in Israel, a real Mecca of psytrance for almost 20 years. Today, he has also signed with a big Belgian label Goamadness and plays regularly in Flanders. Although Asmik is known for his psychedelic performances, he is also a great eclectic who touches everything that pleases him musically, from the minimal via neurofunk or frenchcore. Underground between disappointments and opportunities. I could not help but ask him for his opinion on the underground culture, where he has been living for almost 6 years. In the future Asmik would like to perform on the biggest scenes of psytrance such as BOOM festival, Ozora and Lost Theory. Following the conversation we had with him, we discovered a passionate artist very knowledgeable about the culture in which he evolves, we are sure he is only at the beginning of his career and that he will go very far ! I can only encourage you to discover this promising and talented artist, who will not stop making you dance with his amazing sounds and extremely well handled. I invite you to follow him on facebook and soundcloud . If you feel like going dancing under the Ghent sun, he will be present at a free open air: HalluGen Free Open Air: Down The Rabbit Hole 2 the date is not yet planned, but it should not delay!